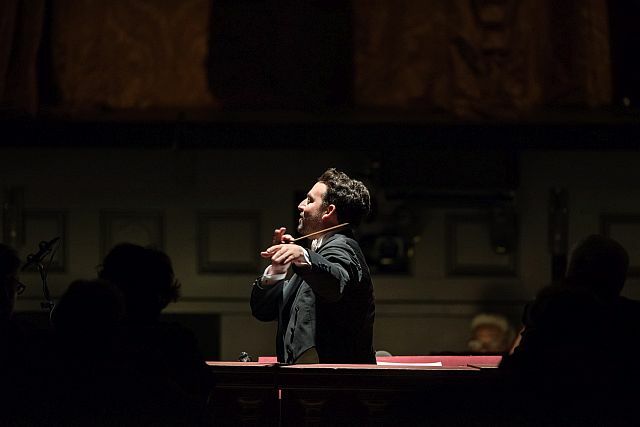 It was the usual December Comfort & Joy, witnessing the explosion of young talent at the S.F. Opera Adler Fellows‘ “The Future Is Now” concert last night in the War Memorial, but there was also a difference, and vive la différence! James Gaffigan. Photo by Kristen Loken. Traditionally, these concerts have begun with a big, noisy overture, and have ended with “Make Our Gardens Grow” or such. Last night Gaffigan opened the concert with the surprising and risky choice of the Prelude to Humperdinck’s Hansel and Gretel, and at the end Toni Marie Palmertree sang the seldom-performed “Col sorriso d’innocenza” from Bellini’s Il Pirata — both to the audience and to the other Adler Fellows lined up behind her. Wagner, Bellini, Richard Strauss, Donizetti, and more: they marched by virtually without pause (thank you, Ms. Umezawa, allowing time only for applause), each completely its own, Gaffigan shifting effortlessly from genre to genre, dramatic to lyrical, “heavy” to comic. The San Francisco Symphony’s assistant conductor ten years ago, Gaffigan was making his Opera debut at this concert. The Opera Orchestra — between virtually nonstop bouts with Turandot and Girls of the Golden West performances — played wonderfully well, with Kay Stern as concertmaster, principals Carla Maria Rodrigues (viola), David Kadarauch (cello), Julie McKenzie (flute), Mingjia Liu (oboe), Jose Gonzalez Granero (clarinet) — and many more. Harpist Olga Ortenberg-Rakitchenkov made a special contribution. 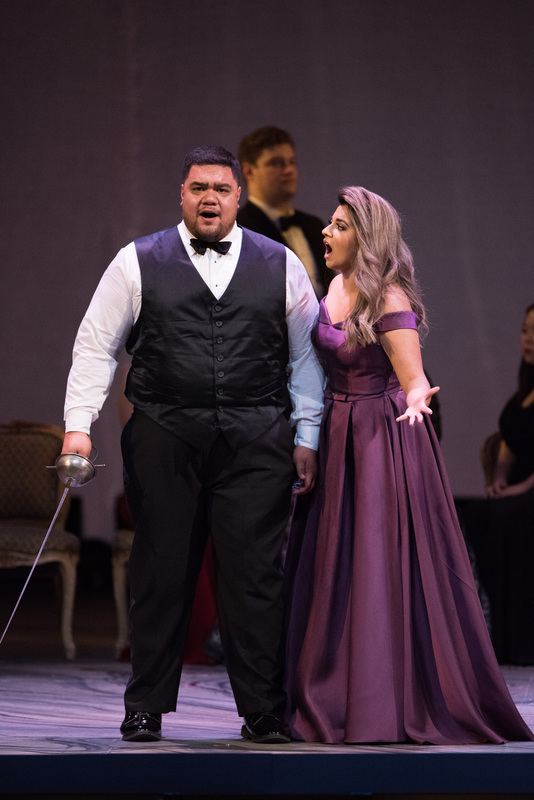 Tenor Pene Pati and soprano Amina Edris at The Future is Now: Adler Fellows Concert on December 8, 2017. 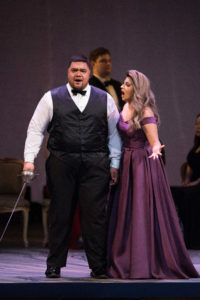 On the stage, Pene Pati was a triple threat: he opened the concert in the title role of Gounod’s Faust in a duet with Brad Walker’s Mephistopheles; he sang a rarely performed aria from Donizetti’s (unfinished) Il Duca d’Alba; and he and his wife, Amina Edris, joined in a duet of lovers from Berlioz’s Benvenuto Cellini. Edris had the stage to herself performing Juliet’s aria from Bellini’s I Capuleti e i Montecchi — singer and conductor adding white heat to bel canto. 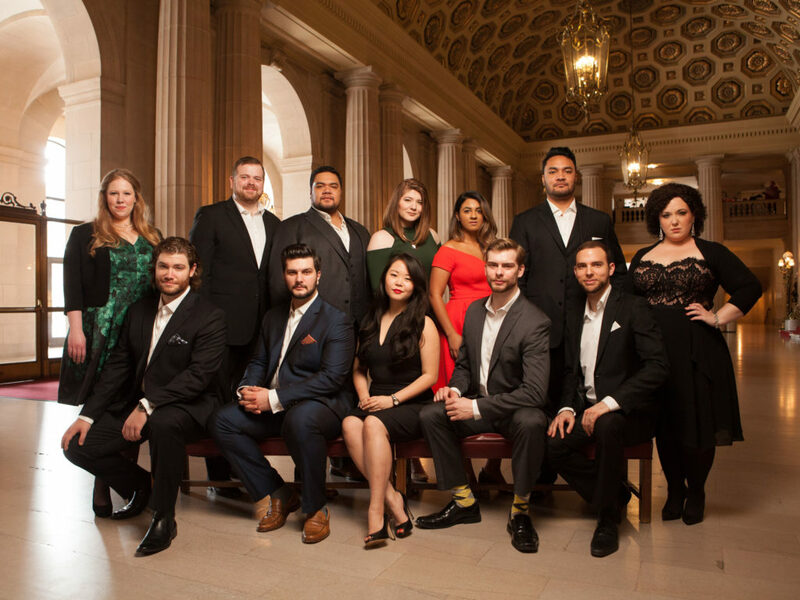 Pati must have skipped the party after the concert because he is now in New York City, getting ready for Sunday’s Tucker Gala, which also features Merola/Adler alumna Nadine Sierra, former Merolina Ailyn Pérez, and SFO Music Director Nicola Luisotti. Yet another Pati, Pene’s brother, Amitai, dazzled with lyric tenor beauty, performing Nadir’s aria from Bizet’s The Pearl Fishers, and as Nemorino, with Anthony Reed’s Dulcamara, in a duet from Donizetti’s L’Elisir d’Amore. 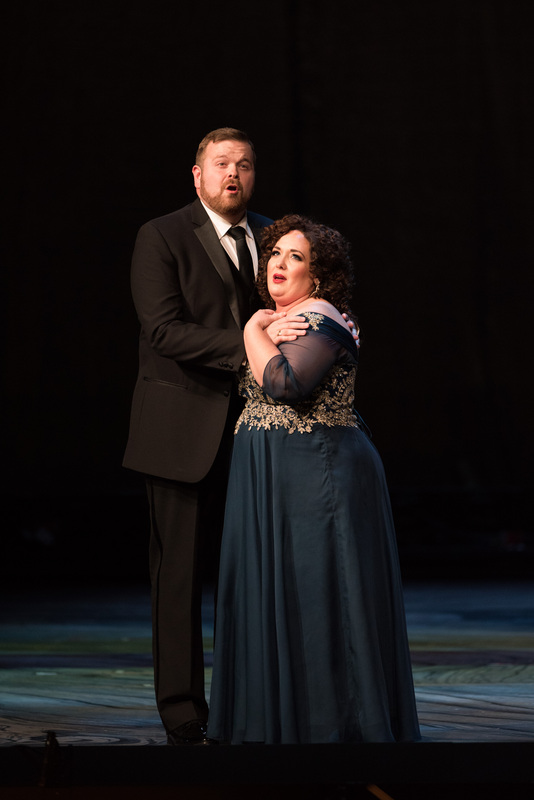 Tenor Kyle van Schoonhoven and soprano Toni Marie Palmertree at The Future is Now: Adler Fellows Concert on December 8, 2017. 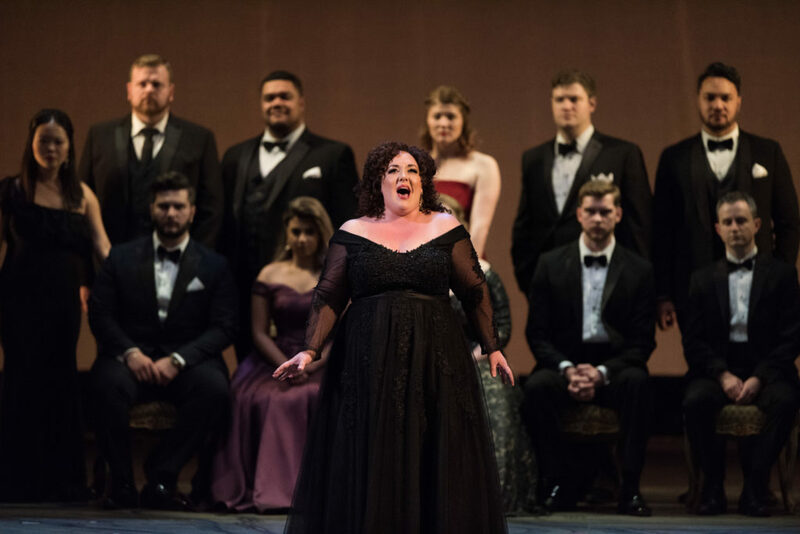 Sarah Cambidge and Brad Walker shone in a duet from Verdi’s The Masked Ball, and Cambidge sang memorably the title role in a duet from Strauss’ Arabella against Andrew Manea’s Mandryka. The music is timeless, but the text — reflecting the composer’s fantasy of having an unconditionally submissive wife instead of the formidable Pauline de Ahna — now causes both squirming and giggles. Manea and Reed sang a duet from Verdi’s Il Trovatore, and Reed’s best turn came in a rare French version of “Et toi, Palerme” from Verdi’s Les Vêpres Siciliennes. Ovation at the end of the concert was long and intense, well deserved by all. Soprano Toni Marie Palmertree at The Future is Now: Adler Fellows Concert on December 8, 2017.